Dealing with multiple vendors can be expensive, time consuming, risky and a logistical nightmare. Especially with today’s pressure on decreasing costs, managing with less staff and new requirement to protect and monitor ever increasing threats from domestic and foreign threats. 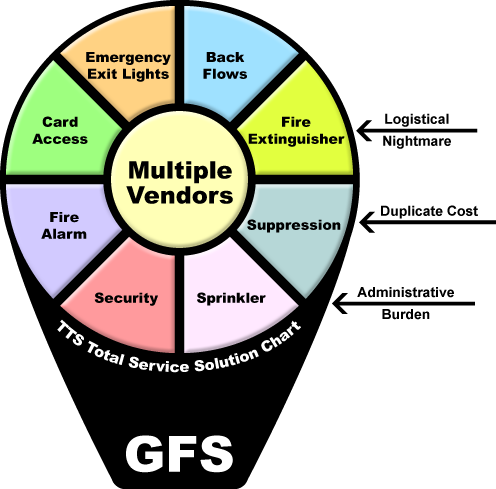 Global Fire & Safety by contrast can provide you a “Total Service Solution” that allows you to have a single service contract to provide you simple and complete accountability for all of your logistical, scheduling, maintenance and vendor management. This “Total Service Solution” is what has made Global Fire & Safety a true leader in assisting Facility Managers in the Life Safety and Security Sector. Global Fire & Safety provides quality, certified, screened and NICET trained professionals to accomplish any service or installation project that your facility may need now or into the future. Our full service and installation team can handle any project that you have from simple tenant finish to large multi-Building Campus projects or anything in-between. So to keep all your systems at the peak of efficiency and always in compliance with Federal, State and local requirements make one call and start getting your TOTAL SERVICE SOLUTION.